Vintage appeal meets modern design in a home style that has stood the test of time. As American as apple pie, we’re all familiar with the classic farmhouse. From the 17th-century green-shuttered home made famous in the pages of Anne of Green Gables to the white picket-fenced nod to the American Midwest in Field of Dreams, images of these simple-yet-stately homes are icons in American culture. 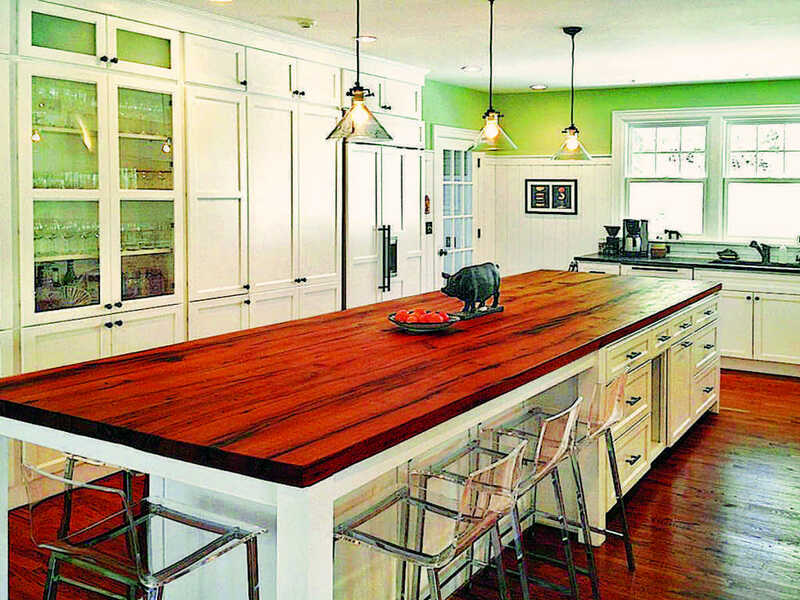 But what defines the farmhouse style? And what characteristics contribute to its long-lasting appeal? To start, take a look back in time. 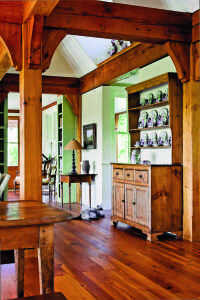 “In the past, families required simple structures that provided shelter, gave them a place to entertain and live in comfort, and American farmhouses have always met the needs of the families who lived where they worked,” explains Jennifer Hastings, customer representative at Yankee Barn Homes in Grantham, New Hampshire. To meet those basic needs, the farmhouse was initially influenced solely by function and geography. The medium used to build farmhouses has also changed over time. American colonists built the earliest farmhouses in the 18th century, often made from rough-hewn logs, native stone or mud. In the mid-19th century, when railroads began transporting materials across the country, homes were built from brick, lumber and quarried stone. This access to materials, particularly milled lumber, allowed farmhouse builders to also incorporate details to reflect the times, such as ornate porch columns for a Greek revival farmhouse, or stained glass and jigsaw-cut trim to give a Gothic flavor. In a farmhouse-style timber home, the frame can make open spaces feel more intimate. So how will your timber frame go together with a farmhouse home? Perfectly. 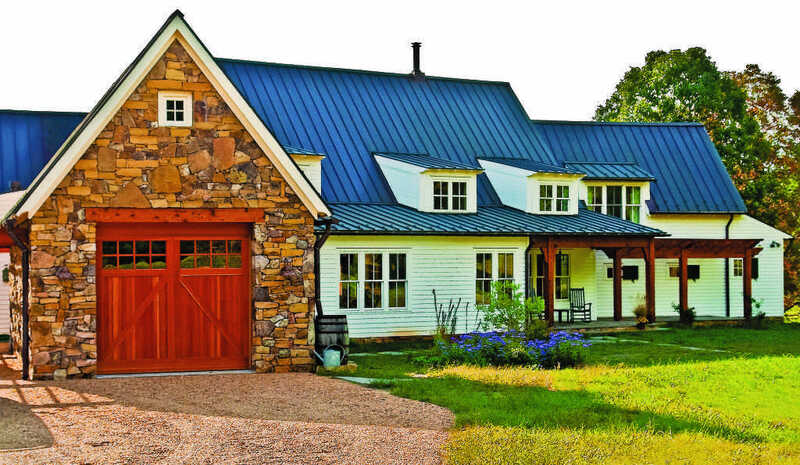 Conduct a quick Internet search for “timber frame farmhouse,” and you’ll be bombarded with photos, plans and design tips for this style of home. Why? Because timber frames and farmhouses go hand-in-hand, thanks to their historical relevance, simple lines and family-oriented designs. That’s right — even though the farmhouses of yesterday featured more formal areas in the front of the home (we’re talking about dining and living rooms that are often left out in more modern houses), their focus has always been on including space to accommodate the family. Fortunately, timber-frame design lends itself to this style of living, boasting size options and open layouts. In the case of a more scaled-down design (perhaps in a farmhouse kitchen or bedroom), the beauty of the frame will draw eyes upward, making the room feel larger. On the other hand, in open areas such as the main living spaces, the frame connects the volumes and brings them down to a more human scale due to the warmth of the wood and the joinery. And it’s that open feeling that’s perhaps the biggest advantage of using a timber frame for the structure of your farmhouse home. Because of the way the frame is constructed, the home’s outer shell rests comfortably on the home’s frame, lending itself to an open-concept design that’s casual and informal, while still visually impressive. Plus, a less-structured layout means you’ll be able to modify your home’s interior living spaces as your lifestyle and needs change over time. Also, because timber homes can use a variety of exterior materials having nothing to do with the inside, they can take on any style. Unlike log homes or regionally-styled homes, no exterior shell or materials define the look of timber-frame houses, which is why the finishing options you choose make such a huge impact on the overall aesthetic of your home, and give you the opportunity to create a true farmhouse.